A thoughtful review by Richard Mabey on Being Empowered for a Healthy Heart. Thank you, Richard, for your support! 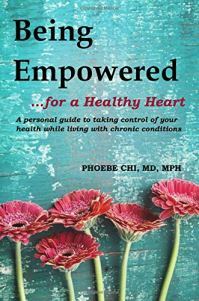 I totally enjoyed reading Dr. Phoebe Chi’s book, Being Empowered …for a Healthy Heart. It is such a good read and I learned a lot from this book. It is a very well organized book and chock full of useful information, for one to maintain good health. This book is a must have and a must read for anyone interested in attaining maximum health. As a chiropractor, I was very impressed with Dr. Chi’s chapter on back exercises. What I like so much about this chapter is that Dr. Chi writes to communicate with the reader, not to impress the reader. There is a kind of unique conversational tone in Dr. Chi’s writing style. Which is rather rare in self improvement books in the field of personal health. Have you ever been told that your blood pressure is high? Are you already on medications for your blood pressure? If so, you are not alone. Just in the U.S., it is estimated that half of all adults–over 100 million people–live with this condition. In this post, I will discuss the fundamentals of high blood pressure, how to properly monitor your own blood pressure, and what you can do on a daily basis to help improve your blood pressure. Back pain. If you’ve ever experienced it, you know how debilitating it can be. In this post, I will be discussing simple exercises that you can do to strengthen your core muscles, help alleviate back pain, and prevent future injury. For a more detailed discussion on back pain, please refer to this article.